Gothic art and architecture are always interesting to see. 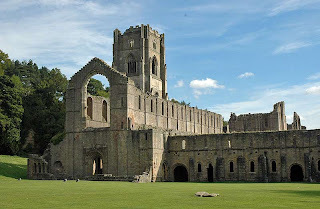 One is the Fountain Abbey in North Yorkshire, England, founded by Cistercian monks in 1132. This is the remains of the largest monasteries in Britain which in 1987 was awarded World Heritage status. 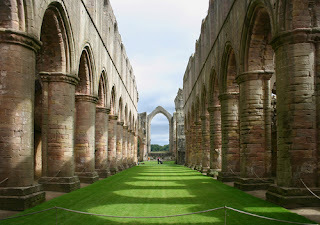 Visit Fountains Abbey from the west, you'll be presented with the best vision across Abbey Green to the abbey church. On the right side of this site, you will also see a small river Skell. Since the length of the river Skell provide an important water source for the monastery. Turning to the south side of the church, you can see the cluster of buildings in the monastery. Meanwhile, behind the monastery to the east, the land area Studley Royal Park is waiting for you. Back to the past, the construction of the abbey church was started in 1135. Over time, the remains of the building is now a natural carpet of grass and open to the sky. This medieval church building is one of the most impressive scenery in Britain. If looking for the oldest, western area is the place, where there is a long nave with a large cylindrical pillars and Romanesque round arches. The western front has a small central portal with large windows on it. Go to the beginning of the 13th century, the original chevet at the east end of the choir was replaced by five-bay, and the cross-shaped church (transept) dubbed the Nine Chapel Altar. At 1483, the three openings on the east wall is replaced with a large single window that can be seen to this day. Then in 1494-1526 a large tower was added in the north transept. The tower has four stories with a height of 50 meters. Though magnificent, this is actually something odd in the monastery, because the original Cistercian principles prohibit the luxury tower. Bonuses are added to the interesting ruins of Fountains Abbey Studley Royal is a landscape park on the 18 th century. This extensive landscaping combine several ponds, ornamental monuments, and other buildings in the beautiful view. To see the beauty of the abbey church, you can come any day. In the October to March from 10:00 to 16:00 am local time while in the April-September from 10:00 to 18:00 o'clock local time.